If you’re looking to book an action-packed activity for a group of friends, kids or a stag or hen do in Central London you’ve come to the right place. We’ve got everything you need for a fantastic game of bubble football in one of our specially selected Central London venues. Also known as zorb football or bubble football in body zorbs. The beautiful game in an inflatable bubble! AMAZING FOOTBALL SKILLS ARE NOT REQUIRED – to get the ball from your opponent you’ll need to bash into them, resulting in some hilarious bounces and a truly memorable experience. A Bubble London employee on his way to work! London Venues: We play in a hand-picked selection of exclusive venues in Central London zones 1 and 2. These include London Waterloo – Colombo Centre SE1 8DP (a short walk from the London Eye and Southbank), Shepherd’s Bush/White City – Westway Sports Centre, London W10 (near Westfield shopping centre) and Mile End – Mile End Leisure Complex E3 (very close to the city). All have great transport links and lots to do nearby. 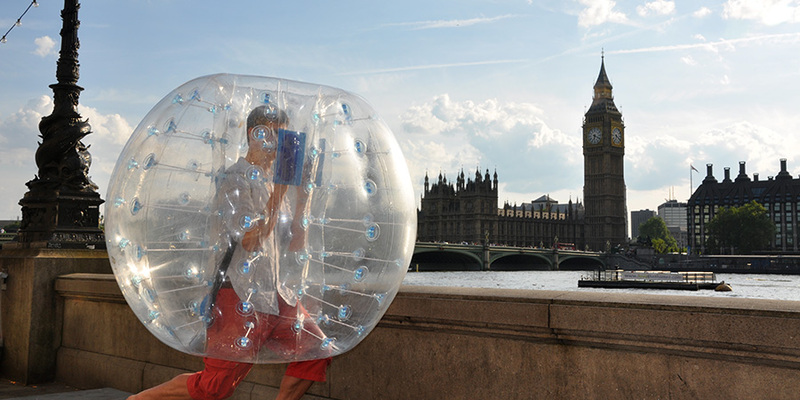 If you’re outside London, please our sister company Zorb Football UK by Bubble Boys who accommodates venues nationwide. All our bookings are run by our fully-trained staff on great pitches and with first-aiders on site. Everything is included – unlike other suppliers we never charge extra for pitches. 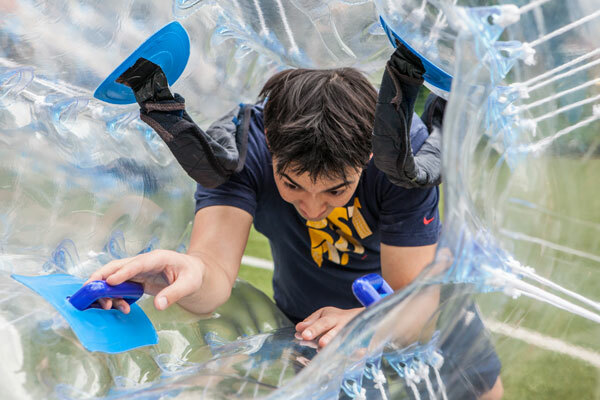 Whether you’re looking for just a kick around in body zorbs, want to organise a corporate day, either for team-building or just to solve office disputes, throw a kids party, or add something special to an event we’ll help you have a great time. Can anyone play bubble football? As long as you are reasonably fit, have no medical concerns and are tall enough to wear the bubble (approx. 4ft9in) you should be just fine. We allow players aged 10 years and older. Got any more questions? 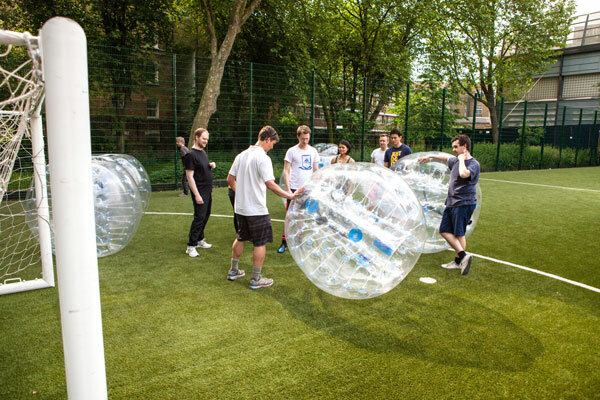 Check out our bubble football FAQs section and have a look at Photos from our events. Ready to book? You can check our live availability and book online instantly.